When it comes to holiday shopping, where is the majority of money and advertising dollars being spent? On kids toys of course! Every kid wants to have the newest and coolest toys that are released during the holidays, and parents and Santa don’t want to disappoint! 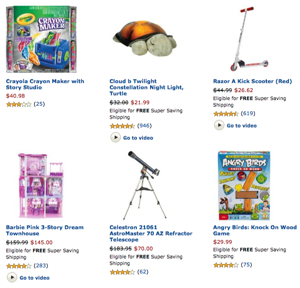 Making sure both children and parents see ad campaigns for all of the holidays hottest toys will go a long way in determining what are the top sellers for each year. This is the final post in our three part “Earn More this Holiday Season with VigLink” series, which has been highlighting the many different trending and top selling products which are available during the Holidays. Just like in our top gaming consoles and top mobile devices posts, VigLink provided some great information on the top selling products for the upcoming holiday season, with all data being backed up by their own sales figures. In this post we are focusing on the top selling video games and accessories. This classic from Mattel is still tops: Live the fab life with Barbie Dolls & Accessories! Hot Wheels are still incredibly popular, and are a must have gift for the little auto enthusiast on your list this holiday season. The popular movie comes alive with all the Transformers action figures. Star Wars Lego Sets are galactic fun for kids of all ages this holiday. Cars 2: With authentic styling and details, this popular character is die cast, and perfect for recreating all the great scenes from the movie. Another one of your favorite characters from the Disney Pixar film, CARS 2, in 155th scale. Bring Harry Potter play alive with these popular Lego sets. Get the real deal with the real Lightning McQueen. Watch his eyes and mouth come to life with amazing impulse projection technology. Get in the pilot’s seat of the air hogs camera plane for an adrenaline pumping ride full of high-action video. Special Cars 2 character featuring Formula One Driver Lewis Hamilton, with actual rubber tires. How Can You Use this Information and Make Money with VigLink? You don’t have to wait for the holidays to start thinking about ways you can make money with the hottest toys of the year and the customer buying frenzy. Instead, get ready before the rush and create a review based web site on individual product and toys. By focusing your efforts on building niche web sites, you can have your web site ranked in time for the holidays next year and cash in on the buying trends. As you can see from the VigLink top ten list for kids toys, there are many classic items in there that continue to rank among the highest sellers every year. Barbies, Hot Wheels, Star Wars and Harry Potter toys will be around for years to come, so building a niche web site on these products is a sure bet. When it comes to monetizing your web site, that’s where VigLink comes in. Just like you would earn a commission if someone purchased through your link to Amazon.com, you can place VigLink on your site and start earning a commission for each click or sale generated from your web site. The best part is that VigLink does all the work for you, by matching your web content with quality advertisers and products your site visitors would be interested in. If you aren’t currently a VigLink customer, now is the time to signup. If you register via this URL and install VigLink before Dec 15th, you’ll be entered to win one of the top 2 products on each list. To learn more about VigLink and how you can start making money with their service and learn more about customer buying habits, visit our “Earn More this Holiday Season with VigLink” post. Is the RPM a Critical Statistic in Google Adsense?